were previously cleared, either for agriculture or silviculture. undergoing conversion to housing bears closer examination. the atmosphere may be quite different. mosaics (Kaye et al., 2006). emissions given potential projected growth scenarios. and thus is ~100 year old secondary growth (Robbins, 1985). of which are for ested (Pu get Sound R egional C ouncil, 2008) . in larger housing developments in the region). rich soils of the region. shrubs, and lone trees left standing during the clearing process. lose any C during development. but that error is equally distributed between our two land use types. soil C loss from beneath the driveway. ing that the data did not violate the assumptions of normality. encompasses the majority of the literature for these estimates. 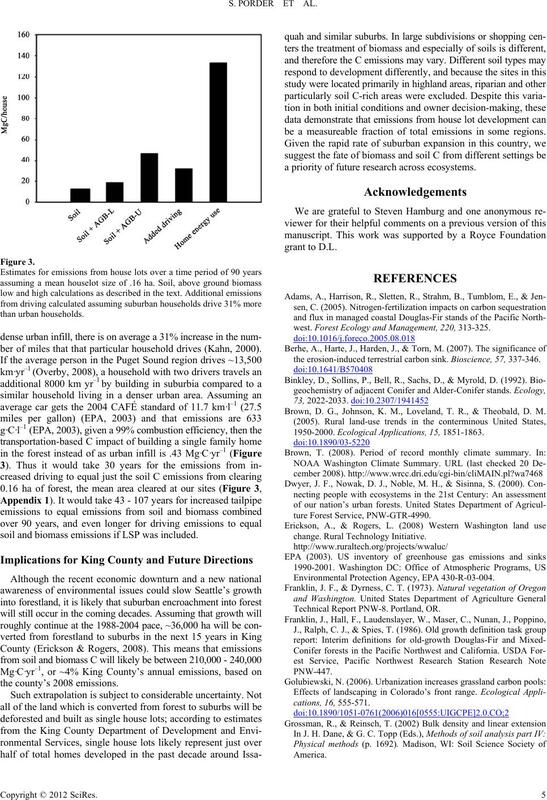 data from the Forest Service was 1900-1990.
broad mix of native softwoods and non-native planted hardwoods). make a more nuanced estimate. at .77 ± .24 and 1.0 ± .05 g·cm–3, respectively (p = .003, n = 18). years, this sugg ests em issio ns of .4 0 - 2.4 Mg ·C·h a–1·yr–1. lot during development that does not re-accumulate over time. jority (>90%) of C in house lots is stored in soils (Figure 2). 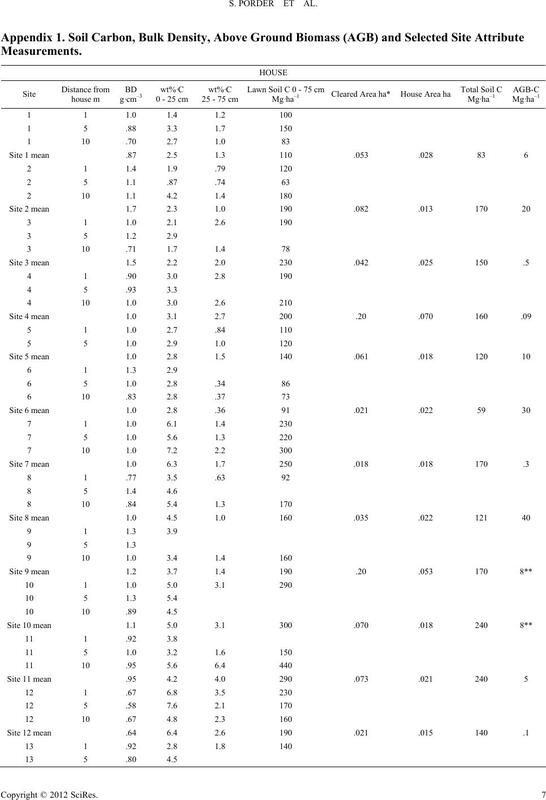 overestimate the amount of C in house lots by ~10%. losses from house lot clearing. 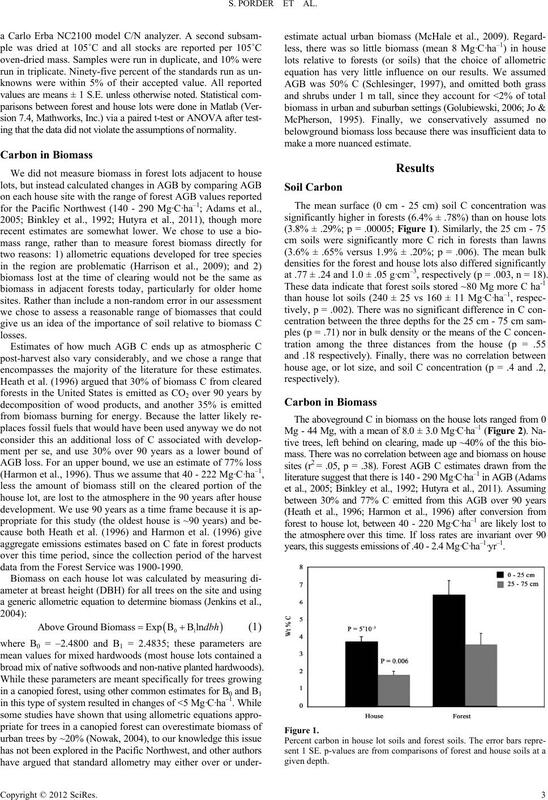 biomass of these old growth forest is 380 Mg·C·ha–1. C source as the biomass and soil C is emitted. ber of miles that that particular household drives (Kahn, 2000). soil and biomass emissions if LSP was incl uded. be a measureable fraction of total emissions in some regions. a priority of future research across ecosystems. west. 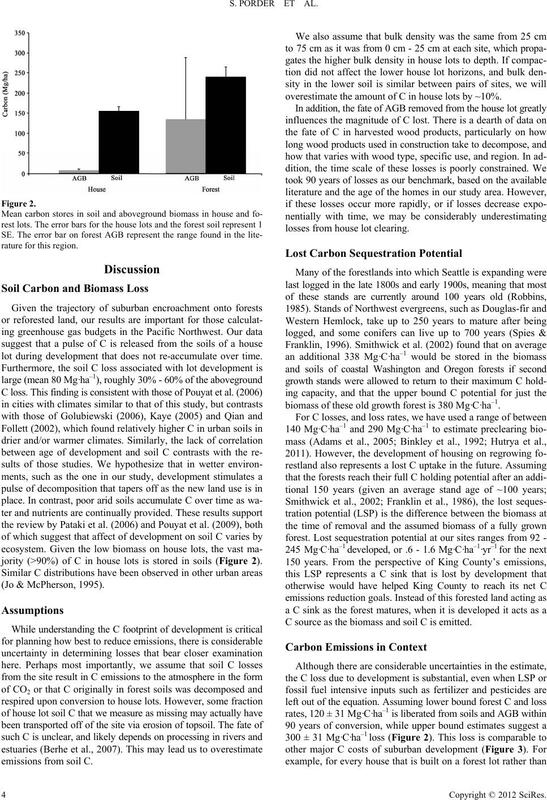 Forest Ecology and Management, 220, 313-325.
the erosion-induced terrestrial carbon sink. Bioscience, 57, 337-346. Brown, D. G., Johnson, K. M., Loveland, T. R., & Theobald, D. M.
1950-2000. Ecological Applications, 15, 1851-1863. Environmental Protection Agency, EPA 430-R-03-004. 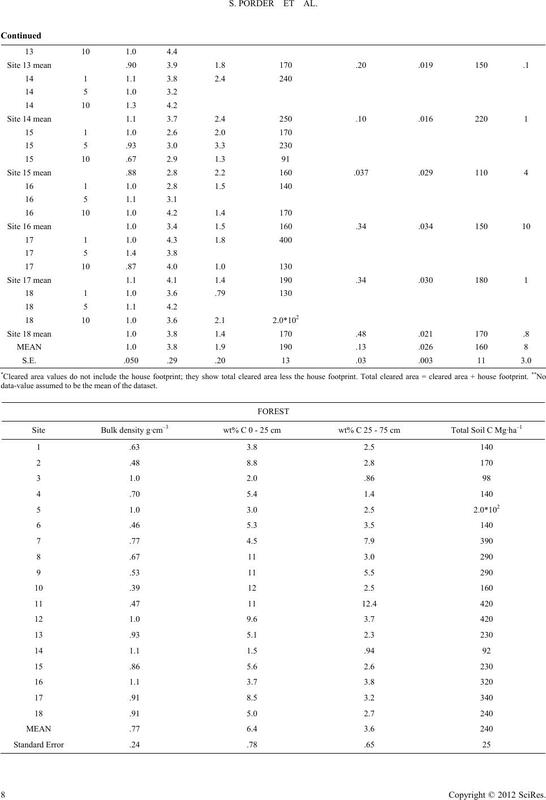 Technical Report PNW-8. Portland, OR. 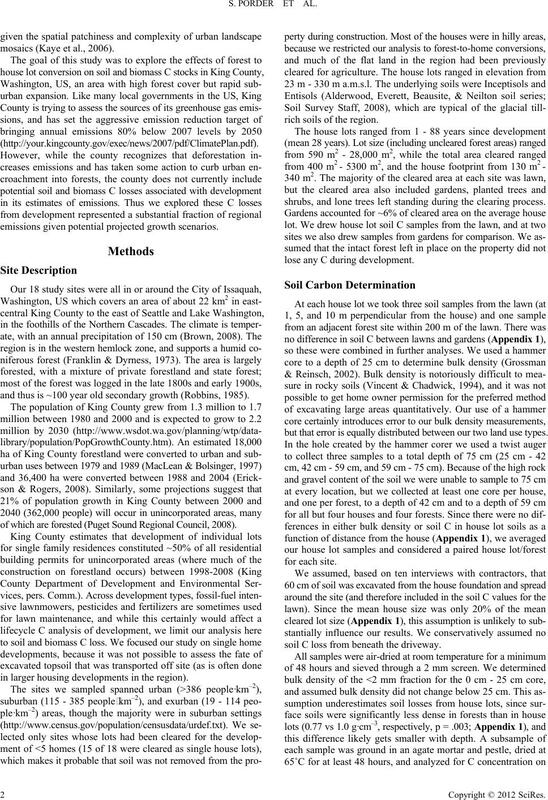 carbon stores in Oregon and Washington forest products: 1900-1992.
Review of Earth and Planetary Sciences, 35, 313-347.
across a gradient of urbanization: A study of the Seattle, WA region. 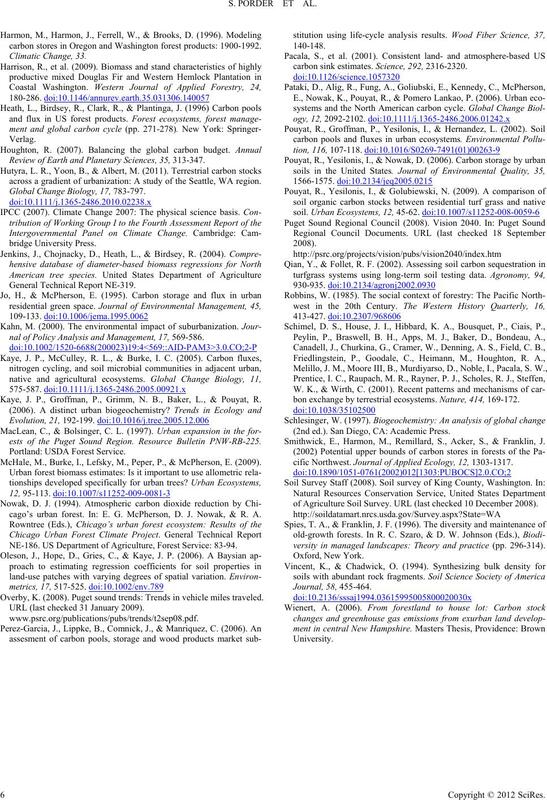 Global Change Biology, 17, 783-797.
nal of Policy Analysis and Management, 17, 569-586. Kaye, J. P., Groffman, P., Grimm, N. B., Baker, L., & Pouyat, R.
ests of the Puget Sound Region. Resource Bulletin PNW-RB-225. McHale, M., Burke, I., Lefsky, M., Peper, P., & McPherson, E. (2009). cago’s urban forest. In: E. G. McPherson, D. J. Nowak, & R. A.
NE-186. US Department of Agriculture, Forest Service: 83-94. Overby, K. (2008). Puget sound trends: Trends in vehicle mi l es traveled. URL (last checked 31 January 2009). carbon sink estimates. Science, 292, 2316-2320.
bon exchange by terre st ri al ec osys te ms. Nature, 414, 169-172. (2nd ed.). San Diego, CA: Academic Press. Smithwick, E., Harmon, M., Remillard, S., Acker, S., & Franklin, J.
cific Northwest. 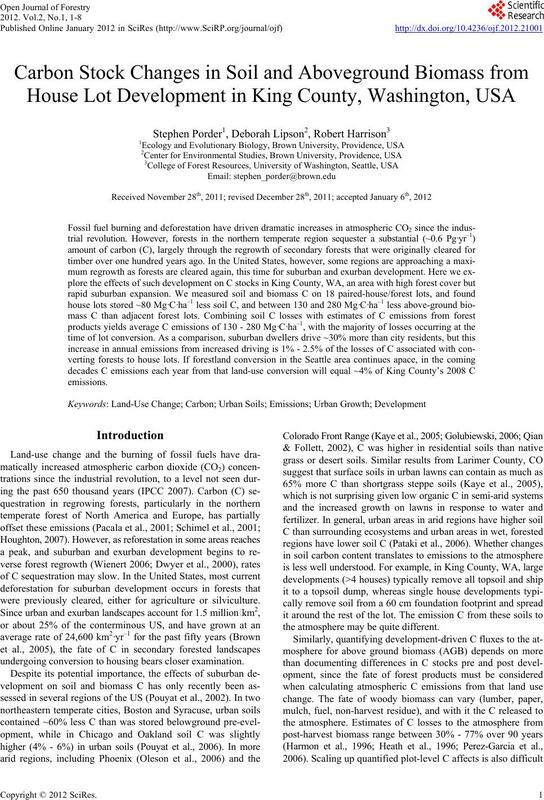 Journal of Appli ed Ecology, 12, 1303-1317.
of Agriculture Soil Sur vey. URL (last checked 10 December 2008). versity in managed landscapes: Theory and practice (pp. 296-314). data-value a ssumed to be the mean of the dataset.